Fraunhofer is Europe’s largest application-oriented research organization. Its research activities are conducted by 69 institutes and research units at locations throughout Germany. Fraunhofer employs a staff of 24,500 who work with an annual research budget totaling 2.1 billion euros. Of this sum, 1.9 billion euros is generated through contract research. Affiliated international research centers and representative offices provide contact with the regions of greatest importance to present and future scientific progress and economic development. The supply with resources is a major topic in the economic and social development of industrialized nations. Besides the improvement of resource and energy efficiency this includes the recovery of valuable resources as well as the search for substitutes for scarce or critical resources. Fraunhofer Project Project Group for Materials Recycling and Resource Strategies IWKS in Alzenau and Hanau focuses on this future-oriented task. Our goal is to make materials and valuable substances recyclable to keep them in the substance cycle. In close collaboration with our partners, we develop innovative separation and sorting methods, treatment procedures as well as new resource-efficient products that secure a technological advance for our customers. Dr. Andrea Gassmann leads the Strategy and Networks group at Fraunhofer Project IWKS in Alzenau. She holds a PhD in Materials Science from Technische Universität Darmstadt, Germany. 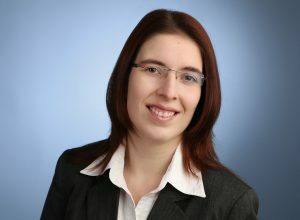 From 2010 to 2015 Andrea worked as a Postdoc leading the “Organic Electronics”-Group at the Materials Science Department (TU Darmstadt), teaching and contributing to several R&D projects. In early 2015 she joined Fraunhofer and first worked as a researcher in the field of lighting. Due to her time at university and her work at Europe’s leading research organization Andrea is experienced both in the academic world as well as in the interaction with professionals from industry.